“The Cabaret Voltaire. Under this name a group of young artists and writers has formed with the object of becoming a center for artistic entertainment. In principle, the Cabaret will be run by artists, permanent guests, who, following their daily reunions, will give musical or literary performances. Young Zurich artists, of all tendencies, are invited to join us with suggestions and proposals.” [Hugo Ball,La fuite hors du temps (, 1993) 111]. This was the beginning of Dada, one of the most exemplary, forceful & investigative movements in poetry (& extending to, dis- & in-corporating, de-turning all the other arts, thus in a profound way introducing multimedia & performance art & the most interesting methods of investigating the relations between art and world). It was a time of war — the "Great War" or the war to end all wars — though of course it did not end wars, and dada's inspiration or better, its counter-push was based on the horror of a war in which there was no good, right, "patriotic" side (as there nearly never are in wars). We too are living again in a time of war, in an age even more deliriously scary because of its global insanity. There are a dozen or more lethal conflicts raging simultaneously all over the world right now, conflicts even more gruesome than those of WWI in which conscripted armies slaughtered each other by the million for the supposed benefit of a few kings & arms dealers under the totally hypocritical guise of "patriotism." Today the wars, even the local ones such as the conflict wrecking Syria, are total & the "innocent bystanders," the civilians, women and children are slaughtered as fiercely as the soldiers, while whole ethnic groups are threatened & subjected to genocide. In this country, supposedly at "peace," the police has declared open season on young African-americans, while permitting any sane or insane person to buy war-weapons with which to start mass-slaughters in schools, movie-houses or any other public place of their choosing. As always the profits accrue to the weapons manufacturers with late global capitalism's greed for untrammeled profits having pushed its cynicism so far as to obliterate any difference between wars of aggression &/or defense against external opponents and internal, civil wars. All of this & more is sold to the people camouflaged under the medievalist mantle of righteous religious ideology — vide last night's Republican winner of the Iowa Caucus, Ted Cruz, saying that the truth did not lie with either or any political party but with the judeo-christian god, a non-existing fiction resurrected again and again to fool the people and cover up lies, rip-offs and destruction. The difference between the various theologically-based totalitarianisms that are the official "enemy" of these United States — be it the Iranian Islamo-fascism, or the Saudi Wahhabite-islamo-fascism, or Daesh/IS itself — and the ideology of early 21C America is vanishing. And it would seem that all the alarms sounded by sane people the world over are drowned out by the din of hysterical rhetoric and the noise of explosions. All of which noise covers — & I think that this cover-up is very consciously created by international capitalism, i.e. the global corporations that own not only the wealth of the world but also our "representatives" i.e. the politicians — what is the human species' most destructive war: that against earth, the only place it has to live, a war ironically, tragically, insanely by now nearly won, i.e. the ecological disaster that is the outcome of this war against earth is upon us. Given this situation I was wondering this morning as I think back on those 1916 days of the birth of Dada as a reaction against the insanity of WWI, I was wondering where are the poets today, what are they doing in the face of this absolute disaster, where are the young who should be creating a 21C Dada to try to bring some sanity into our world? Not that I have any illusions as to the power of art to save the world. But unless there is an art commensurate with the horrors surrounding us, how to live in this world, how not to despair? There needs to be a space where another, a saner world can be imagined, can be sketched out, can be proposed. 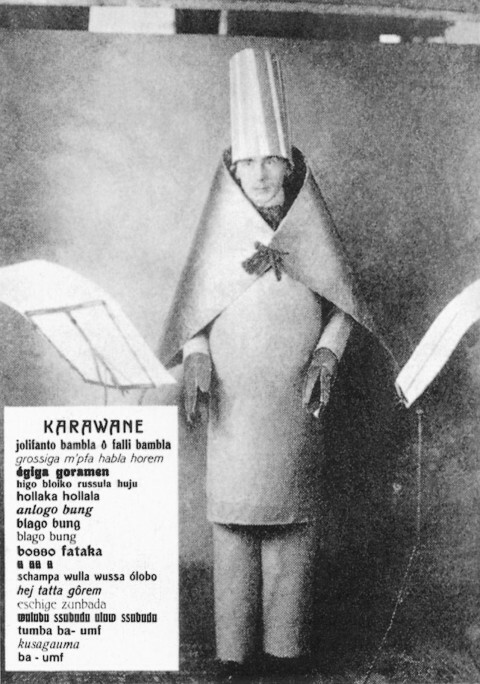 As Jerome Rothenberg & I wrote in our commentary on Dada in Vol. 1 of Poems for the Millennium, the strategy of Dada — & I believe this strategy is worth considering & putting back into action today — is what the poet Ed Sanders later called "a total assault on the culture" or in the words of Richard Huelsenbeck, one of the original dadas, "the liberation of the creative forces from the tutelage of the advocates of power."